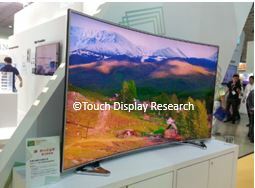 eye tracking Archives - Touch Display Research, Inc.
Touchless Human-Machine-Interaction sensors include voice recognition, gesture control, eye tracking, proximity touch, motion sensors, short-range wireless interaction and others. Microsoft Windows 10 OS added two touchless HMI features: voice control and facial recognition. Apple recently acquired two touchless HMI companies. Facebook joined the touchless HMI wagon in 2014 by acquiring Oculus. 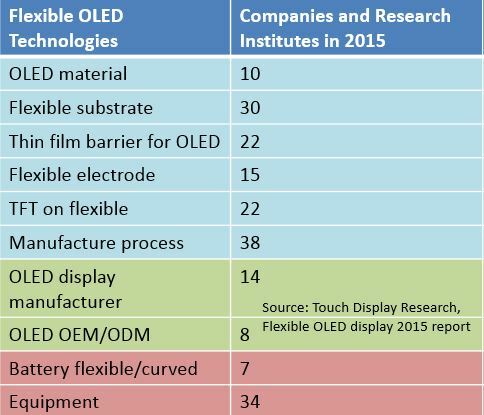 In 2015, Facebook/Oculus acquired another two touchless HMI companies. Augmented reality and virtual reality devices “love” touchless HMI sensors, since they rely on touchless HMI sensors for sensory inputs to function smoothly, and deliver the cool imagery and features. Google announced radar-based gesture control project Soli in 2015. 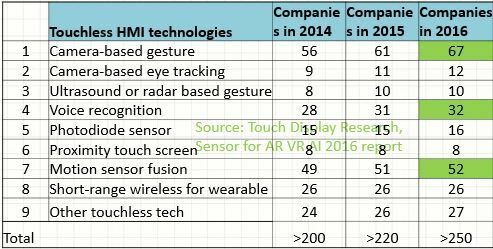 Over 200 touchless sensor suppliers, system integrators, and brand companies working on touchless HMI sensors. Camera-based gesture technology attracted 58 companies working on it; 49 companies are active on motion sensor fusion; 30 companies are active on voice recognition. This entry was posted in Touch screens, touchless control and tagged eye tracking, gesture control, motion sensor, proximity touch, radar, short-range wireless, touchless, touchless HMI, touchless HMI market, touchless human machine interaction, ultrasound, voice command, voice control, wearable on October 6, 2015 by jennycolegrove.